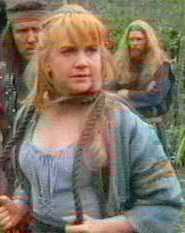 From peasant stock to robin hood clone to thrift store castaways, Gabrielle's Incredible Shrinking Clothing has managed to keep viewers puzzled well into the show's second season. What can we expect from the bard in future episodes? Hopefully, some leather...she has earned it and we deserve it! Why do we love Gabrielle so much? She's pesky, overly sentimental, falls for soupy guys, has a bizarre code of ethics (won't kill but will maim and disfigure -- no problem), and is often made to spew the most nauseating dialogue imaginable (the fireside chat in CALLISTO (#22) with the "We must end this cycle of revenge" stuff is right out of a Sermon on the Mount parody...try cramming those words into Xena's mouth!) Still, we follow every move she makes. Is it because the Warrior Princess likes her so much? That definitely makes her more attractive right away. But we like Gabrielle because she is a work in progress...she's shedding small town provincialism for a wider view without losing her likeable qualities in the process. It isn't yet apparent what she'll turn out to be (Xena Jr.? Mad Maxx in a skirt?) but we know when she gets there, we're gonna like it and until then, we can put up with the schmaltz along the way. 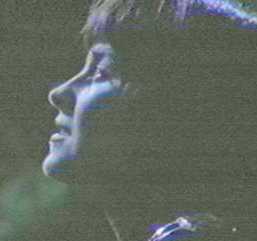 Doesn't it break your heart to hear the drivel that sometimes spills out of Gabrielle's mouth? RETURN OF CALLISTO (#29) gets my vote for the episode most likely to cause violent rebellion among internal organs. "Now I know what love is, it's life." It's hard to imagine anyone concluding that after a NIGHT WITH PERDICUS! Sure, Gabrielle was a naive farm girl, and possibly, from her point of view, that whole prom queen/quarterback thing might look kind of attractive....for someone who hasn't been spending her days and nights with the Warrior Princess!! 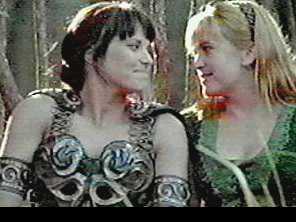 You could just tell what Xena was thinking at the wedding by the look on her face,"Clueless...this chick is totally clueless." A DAY IN THE LIFE (#39) was a fab Gab episode. Here is a woman we could really believe Xena might be interested in for more than just sidekick purposes. Gabrielle was stand up, self-assured, and much less puppy dog than most episodes. To see her revert back to the Malibu Stacy stuff we saw in FOR HIM THE BELL TOLLS (#40) was the cruelest blow. Let's see more of the Amazon Queen Gab, the one who might still look like Anne of Green Gables on the surface, but is 100% riotgrrl underneath. What's with Gabby's Amazing Wheel of Hair Color? Where it will stop next, no one knows. She seems to be stuck on Sunkist Orange for the moment...Burnt Sienna? All in all, it would be difficult to imagine a better pal for Xena than Fab Gab. Now that she's transforming into a more competent character, (and is rapidly being purged of all cloying tendencies) the relationship between the dynamic duo should be more interesting than ever. The chipmunk cheeked sidekick has won her way into our hearts (and it was not an easy battle) and we want to see her role continue to evolve into a 50/50 full partnership with the Warrior Princess, trading the Jedi thing for something much closer to Thelma and Louise.